We were so lucky. December was almost completely dry. It was practically springlike. I got to walk Misha almost every day. Then January came along and the storm door opened. Mind you, we don’t have to deal with the snow like the rest of the country. But, we’ve already had more rain and fog than in December, and we’re only half way through January. Another series of storms is approaching for the rest of the week. As you know Misha does not like the cold weather. 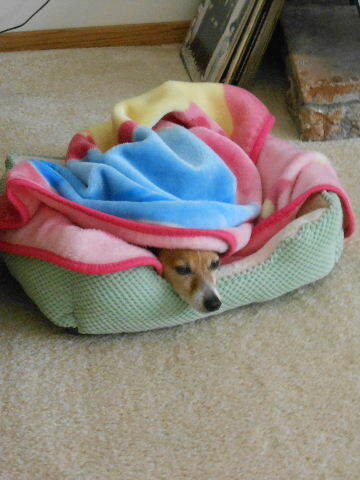 She’s been hunkering down in her blankets. I bet some of you would like to climb in that blanket with her. We love the cold and snow. It is our favorite time of the year! Rain and fog are things we can’t stand as it is very depressing. I bet if Misha saw snow, she’d never go outside. You are tough dogs! The girls do appreciate snow more than rain and we are due for 4-6 inches of what they refer to as snow cookies today. Hope the weather clears up soon for you. I have never heard of snow cookies. I have a feeling it is not as friendly as it sounds.